4Easysoft Mac ASF to WMV Converter is one specially-designed Mac ASF to WMV conversion tool which aims at converting ASF to WMV file on Mac and extracting MP3, WMA audio from ASF files for Mac. The output video and audio can be successfully played on devices like Google Phone, BlackBerry Storm, BlackBerry Bold, Palm Pre, Zune, Zune 2, PSP, PS3, Xbox 360, Dell Player, HP iPAQ. More pleasantly, 4Easysoft Mac ASF to WMV Converter gives users the access to edit video effect, capture any video/audio length, customize video aspect ratio, merge files, preview the final effect, take snapshot etc. And with our cool ASF to WMV video converter for Mac users, you can add watermarks and subtitles to the videos; also users can select output audio tracks. This cool software also supports batch processing which allows you to output different formats simultaneously. 4Easysoft Mac ASF Video Converter is a world-class ASF Video Converter for Mac application to convert video formats such as AVI, MPEG, MP4, WMV, MOV, VOB and HD TS, QuickTime HD MOV, HD RM etc to ASF. 4Easysoft Mac ASF to WMV Converter aims at converting ASF to WMV video with fast speed and high quality. Users can also easily extract audio files like MP3, WMA from ASF video on Mac. With the assistance of 4Easysoft Mac ASF to WMV Converter, it is possible for you to convert ASF files to Google Phone, BlackBerry Storm, BlackBerry Bold, Palm Pre, Zune, Zune 2, PSP, PS3, Xbox 360, Dell Player, HP iPAQ. Users are freely allowed to adjust video Brightness, Contrast, Saturation and check Deinterlacing to promote video effect. Modify video Encoder, Resolution, Frame Rate, Video Bitrate and audio Encoder, Channels, Bitrate, Sample Rate in Settings window to suit your player. All settings can be saved as user-defined profile in preparation for future use. Click Trim button to select your preferred part to convert. Adjust the size of play region by using the Crop function. Select your wanted files and choose Merge into one file to convert them into a whole file. Watch and compare original and final video effect in advance while you adjust it. Reserve your favourite pictures into JPEG, GIF, BMP files in default folder. 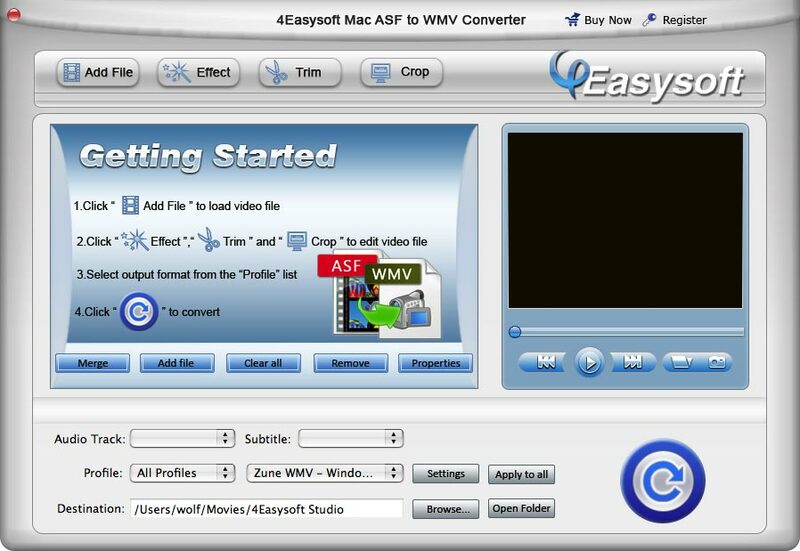 4Easysoft Mac ASF to WMV Converter is especially easy to use. Users can completely master it within several minutes. Powerful watermark function to help you add both text and image watermarks to your videos. Powerful subtitle function and audio track function to extend your enjoyment.